Intracellular transport is performed often by multiple motor proteins bound to the same cargo. 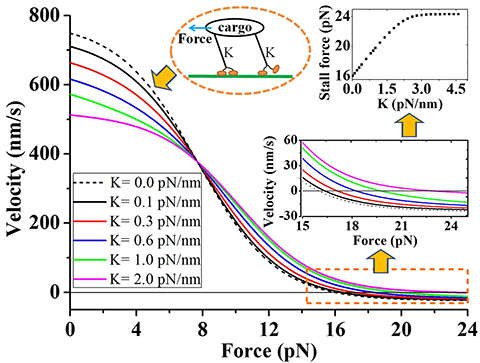 Here, we study theoretically collective transport of the cargo by two kinesin motors. We propose that the motor has only the elastic interaction with the cargo via the linker connecting them and has no interaction with another motor. With parameters values for single motors from the available single-molecule data, we show that at linker’s elastic strength \( K\approx 0.25\) pN/nm the theoretical data of both velocity and run length of the two-motor assembly under no load are identical to the available experimental data. The run length distribution is single exponential. The single-motor-bound state of the assembly dominates the transport. Both the force dependence of the velocity of the cargo driven by single load-bearing motor and that by two load-bearing motors in the assembly are consistent with the experimental data. The stall force of the assembly is larger than the sum of stall forces of two uncoupled motors. Moreover, we predict that the stall force increases with the increase of K and becomes saturated at large K, with the saturated value being 1.5-fold larger than the sum of stall forces of the two uncoupled motors. 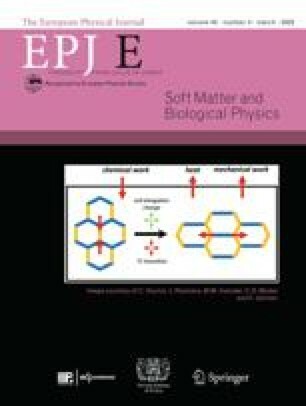 Supplementary material in the form of a .pdf file available from the Journal web page at https://doi.org/10.1140/epje/i2019-11801-4 and accessible for authorised users.